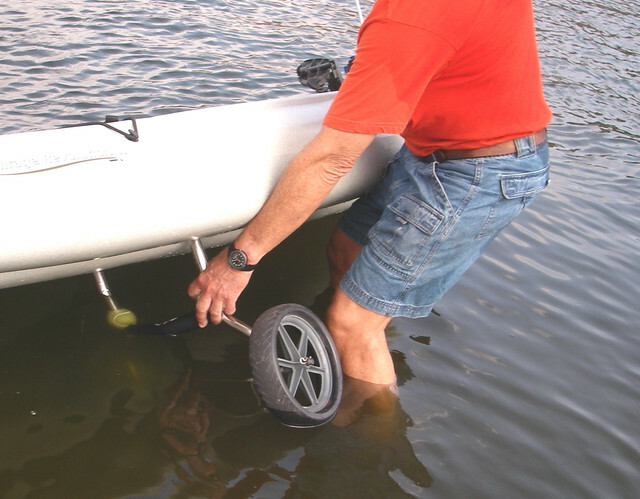 Hobie Forums • View topic - Cart Mount at far rear / false scuppers? Cart Mount at far rear / false scuppers? Post subject: Cart Mount at far rear / false scuppers? Hey everyone. I'm a new Hobie PA12 owner, just learning inshore fishing and loving the yak. The only complaint I have on design is the cart use... having to 'turtle' the yak on the boat ramp to get the cart into the scuppers is as frustrating as getting skunked. I've got the muscle, its just clumsy and awkward. It seems that there should be a pair of 'false' scuppers at the far rear of the yak just to function as a cart mount. It could also be used to keep them far back and out of the way, but more secure than just dropping them in through the handle. How has this design failed to be improved over years of PA sales? I've looked and looked, but haven't seen many mods to the handle or stern to do this. One guy on youtube fashioned a piece of wood and glued/drilled that into the plastic on the stern and then also had to form braces from aluminum... it was functional, but a bit hokey. Another guy used a PVC 'jack' to prop up the yak so he didn't have to turtle it. This is close, but fails the 'pick up with one hand and place the cart in the holes with the other hand while keeping the yak upright' ideal I'm shooting for. I've been thinking that if one could remove the rear handle, a piece of thick metal stock could be mounted between the kayak body and the handle. Longer Hex screws could hold it in place and onto this could be mounted some vertical tubes as 'false scuppers' so that the cart can be used by simply lifting the back of the yak and sliding it in place. 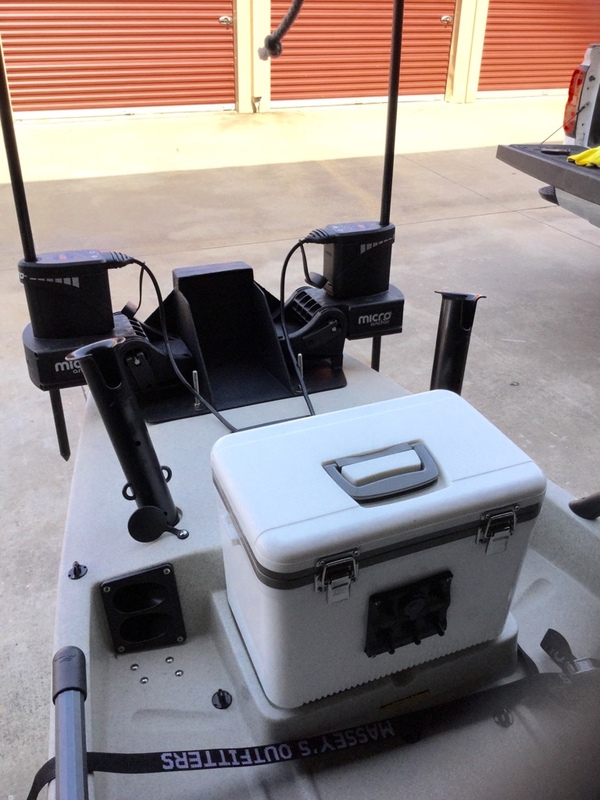 I know the pro angler shouldn't be suspended and stored by the lift handles, and I wouldn't, but just to get the 100 yards from the ramp to the truck, I think it would be ok... it is a 'carry handle' after all... does anyone think this is folly? Has anyone tried this or anything similar (mounting tubes to the rear handle itself is another option I was thinking of)... successes? failures? Hobie, if you're listening... put some 'false scuppers' at the very rear so that we don't have to constantly roll our kayaks over or have a friend near by. 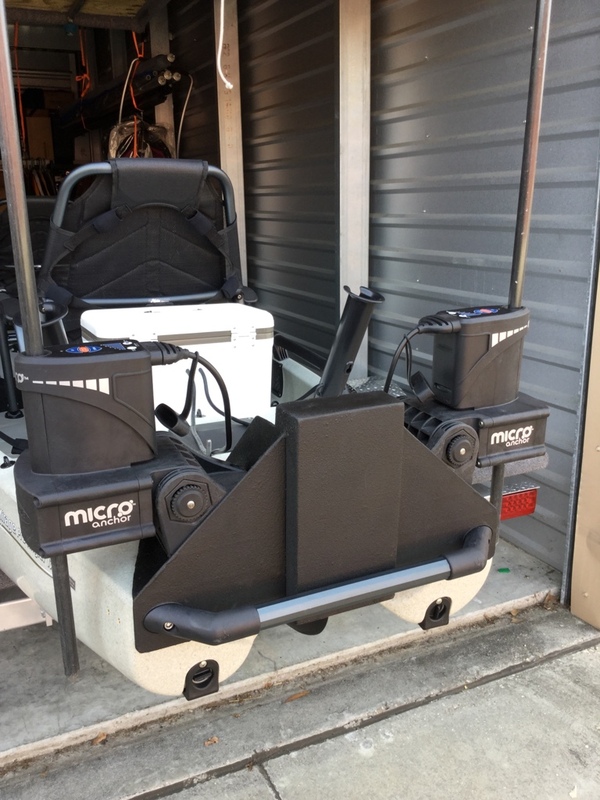 Post subject: Re: Cart Mount at far rear / false scuppers? I also disliked laying it over to place the cart under. I went with the boonedox landing gear on my 12ft. pro angler and it is awesome. 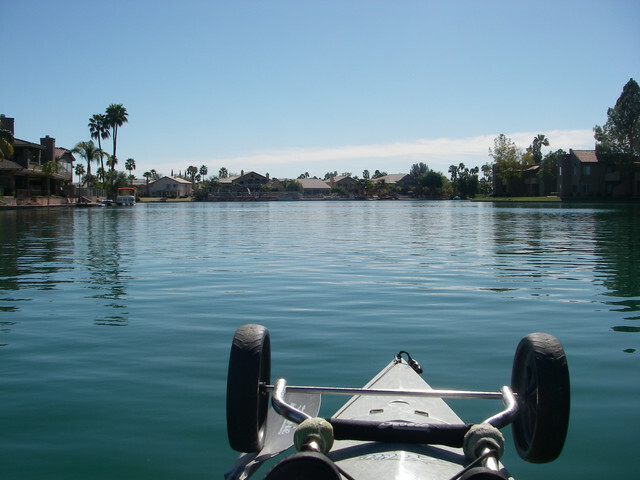 I roll the hobie right into the water and simply flip up the wheels which stay above water until I am ready to take out. Then I flip them again and roll the boat out and walk it to my truck. The landing gear is well made and makes the whole process much better than dealing with a scupper cart. 1) Boonedox. I've seen these, and the functionality is good. I worry more about hull here, however, than with a modded handle. seems like all the weight is spread over 2 plates going through a singly ply of plastic. Also the cost... I didn't purchase the cart it as I bought my yak used, but the previous owner bought the Hobie HD cart and I absorbed some of that in the resale cost. I'd like to use it, I just wish the design for its use was better. 2) Hull strength. I think Hobie could easily engineer 'false' scuppers aft of the rudder adjustment and reinforce them (just as they did farther up the hull) to take the weight of the yak on the cart. They're innovative in mirage drive and mirage drive 180... how about really getting this 'problem' solved... many seem to complain, but the only fix are aftermarket? Seems like a no brainer. 3) The Hobie cradle cart... H to the E double hockey sticks no would I spend >20% of what I spent on the yak only to have to strap that monster on the back and haul it back and forth between the truck... No offense... It IS an option.. and it does avoid flipping... but for that coin, I'll turtle till I rub a hole in the side. 4) I saw on the texas board, someone who did an outboard and 2 power poles on the back of a 17T, they used the rear handle holes and mounted plate that had a 90 and tapered back to also mount in the rudder adjustment plate. Bolt on, bolt off... surely if it could hold a 20HP, it could support 100 yards of carry... I'll try to find a way to post pics... Might have to get this plate fabbed. I thought it was going all the way up to the rudder control hatch, but apparently there is some though hardware... I don't like that... anyone seen this/tried it, etc. for the cart? I pull one of my beach wheels off the (motor side) axle when I carry them to allow full motion of the motor. When ready to land, I insert the cart into the scupper holes (without tilting my TI) and then attach the remaining wheel to the axle. A short cord loop on the cotter pin helps me keep from dropping it. i've done that, works a treat, especially if height of posts are cut down to minimum possible for your hull. I use a trailer for my PA14 now, but for years I just launched and retrieved using a Hobie beach cart. My launch and retrieval routines was to wade out until the stern was in about knee-deep water. 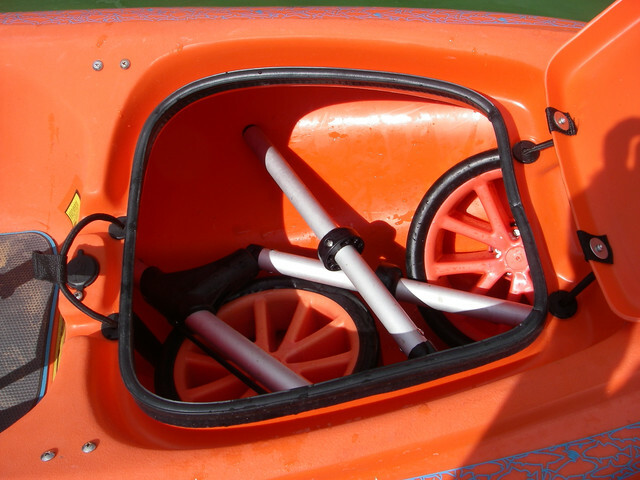 At that depth, the cart could be pulled out or inserted into the rear scupper holes without any difficulty, while the yak and contents remained level. 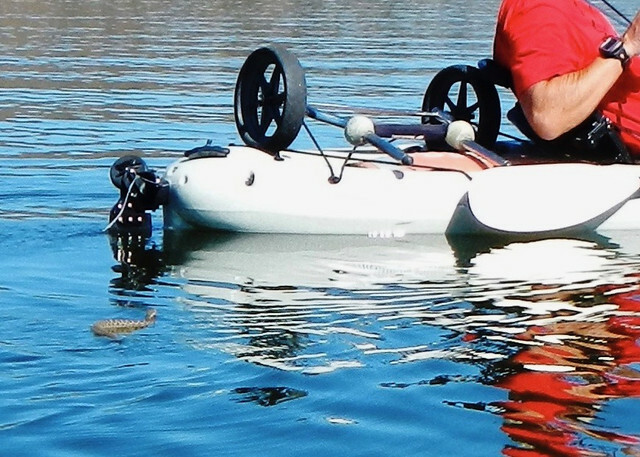 No real need to attach or detach the cart on shore, so no need to roll your yak up on its side. I built a hand trailer using two eight foot lengths of 1" sq aluminum tubing. Makes it easy to drag my PA12 to the ramp and retrieve. No more flipping for me. Would the use of h rail universal mounting plates be an option? Perhaps add 2 plates to which unistrut could be connected and then run a threaded rod through the unistrut to create a cart axle. 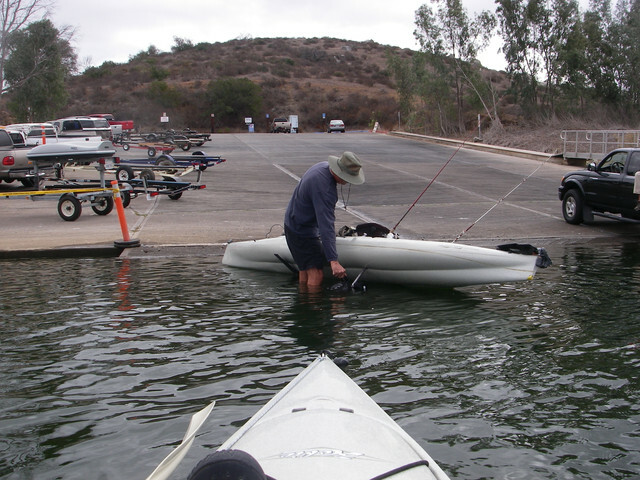 ...having to 'turtle' the yak on the boat ramp to get the cart into the scuppers is as frustrating as getting skunked. I've got the muscle, its just clumsy and awkward. It just takes a little practice. If you have high flotation wheels it might be easier to pop the far wheel off while inserting and install it after the cart is in place as Bob mentioned. It works well on the PA -- just remember to secure your gear before you tilt the boat! There are 3 great places to store your cart on the boat. If all these spaces are committed, you might try sliding the cart legs under the rear cargo bungees and let the wheels rest on the stern. There's always a way.